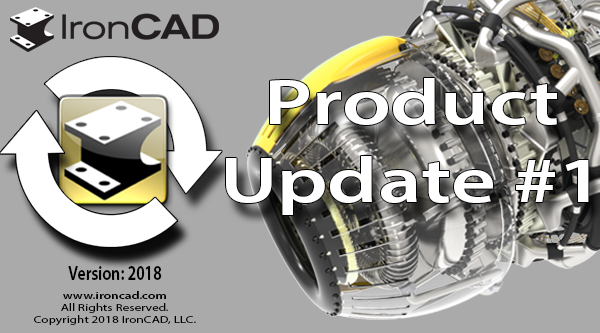 (ATLANTA, Ga.) May 14, 2018 — The 3D CAD platform of choice among metal fabricators and custom machinery equipment manufacturers, IronCAD’s 2018 Product Update #1 adds features specifically designed to increase detailer productivity by streamlining the steps needed to move 3D designs into the 2D production drawings. Key features of Product Update #1 including enhanced game-changing bulk drawing feature and a dramatically improved shrink wrap modeling simplification utility for more secure, more inclusive file sharing to support active collaboration. With the new process improvements for the bulk drawing creation, parts and assemblies can now be selected and can store predefined templates that automatically populate the bulk creation process. This stored information can be used in conjunction with IronCAD’s powerful Catalogs of pre-made designs, speeding up the reuse of existing designs and saving countless hours that might otherwise be spent preparing designs for detailing. Product Update #1’s shrink wrap enhancements include more advance preparation options for packaging up designs and reducing outputted data such as shell representations of designs, supporting secure file sharing options for diverse use cases. Since collaborative design workflows are critical for fabricators and machinery manufactures, IronCAD 2018 Product Update #1 also imports and exports to the latest native CAD formats, supporting collaboration between design groups that use different systems. Quick feature creation from existing geometry by simply pushing and pulling on face handles to create positive and negative shapes. Streamlined interface that improves access and navigation to many common commands. Simple reconnection tools that support IronCAD’s intelligent attachment capabilities making it easy to relocate connected elements. For a full list of IronCAD 2018 Product Update #1’s new features, visit www.ironcad.com/blog/ironcad-2018pu1. Based in Atlanta, Ga., IronCAD is a leading provider of 3D design productivity solutions that deliver the highest levels of customer satisfaction and productivity. Individual components of this solution can be used standalone, complementary within an existing design environment, or can be used together to collaborate effectively throughout the enterprise to extend productivity. IronCAD’s flagship product IRONCAD has won many industry awards for its innovative technology and leads the industry in its ease of use and design productivity. Thousands of customers worldwide use IronCAD to support their success. For more information about IronCAD 2018, visit www.ironcad.com.